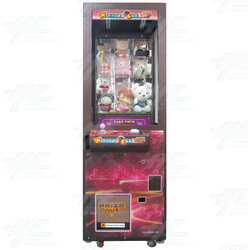 Winners' Cube Classic is a prize redemption arcade game machine from Andamiro. The Classic is a new and revamped alternative to the proven Winners' Cube Model! This wonderful machine will remind all players that everyone can win, but to be a winner, you must plan and prepare! Every player will play for an opportunity to win dazzling prizes by testing their accuracy in pushing off prizes through transparent cells by utilizing two buttons that control a mechanical pusher rod. The objective of Winners' Cube is remarkably simple. Players will be controlling the movement of a slim rod, that is mounted onto a motorized mechanism, with two buttons that control the horizontal and vertical movements of the rod. Once the button is released, the movement of the rod will stop at the location of the desired position. Players will have 20 seconds to plan, and position the rod so that it is aligned to an opening hole of the prize display. Once the rod is positioned successfully, the motorized mechanism will proceed to extend the rod into the hole where it will push a prize off the clear display shelf and drop the prize into the redemption basket.